In anticipation of a long hot summer spent in the garden, why not revive your metal garden furniture? As with most renovation jobs the hard work comes at the beginning, with hours spent scraping, sanding and scrubbing; performing these tasks on a close summer’s day not to be recommended. Add to that the pollen, dust and summer flying insects that can mar paintwork, and painting metal garden furniture begins to look even more like a project best for spring. For the topcoat always try to wait for the perfect day – dry, slightly overcast, with no threat of rain. Discover lots more repair hacks on our dedicated DIY pages. Metal garden furniture will invariably stay looking good for longer if you are able to store it in a shed over the winter months. However, if you’re short of garden storage or if solid benches are just too heavy to move around, make sure the legs are not left to stand on wet grass and cover with plastic sheeting to offer some protection against the rain and snow. 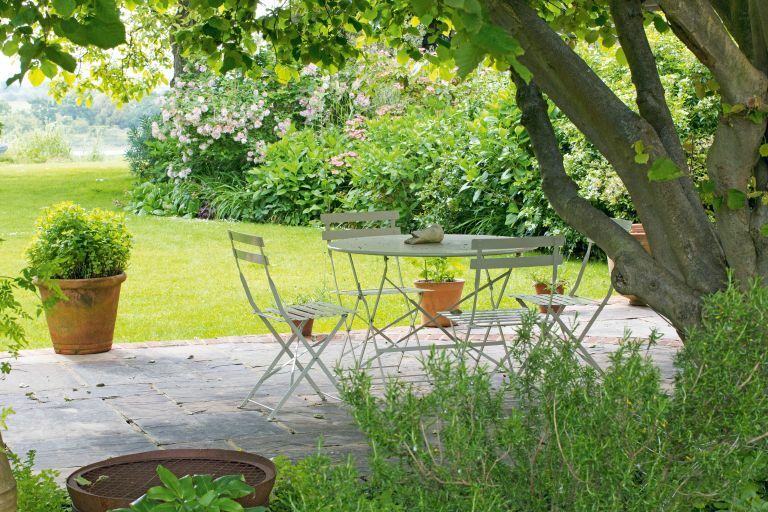 Inspired to start a few more garden projects? Go and check out our garden hub page for more ideas. Check the bolts holding the table and chairs together. Any missing or rusted ones must be replaced. Choose a spanner to exactly match the size of the nut. If it fails to undo them, spray with release oil, such as WD40, then wait and try again. A tap with a hammer will help break the corrosion binding the nut and bolt together, but beware of doing this on cast iron, which is brittle and cracks easily. As a last resort, saw through stubborn nuts and bolts with a hacksaw. Replace with new, corrosion-resistant ones. Wearing heavy-duty rubber gloves, and keeping well away from children and animals, use fungicidal wash or sterilising solution on the furniture to kill off algae and spores. Apply by brush or sponge and leave for 24 hours before washing off with clean water. Household bleach will also do the trick equally well. Place a dust sheet or piece of plastic sheeting underneath furniture to make cleaning up easier. Wearing protective gloves, use a steel brush or scraper to remove loose and flaking paint to make a sound substrate for a new coat of paint. A clean, sharp scraper is very effective. The tabletop is in a sorry state: the paint has worn away and exposed the metal to the elements. The aluminium alloy has degraded to form a fine powdery coating. Use a sanding block and wet and dry abrasive paper to work on the unstable surface until a firm base is reached. Always wear a protective dust mask. Thorough preparation is the key to a long-lasting paint finish. Scrub the garden furniture with hot water and detergent to remove any traces of grease and dust particles. Rinse with lots of clean water. Mop up surplus water with a sponge and leave to dry out completely before moving on to the next step. A specific range of paints can be applied straight onto bare metal garden furniture. The exception is if the metal is aluminium or an aluminium alloy, when a same-brand special primer must be used too. If using a general purpose paint, it’s essential to read the instructions on the can and apply the relevant primer first. While wearing protective clothing, brush on a coat of paint and once completely dry give it a very light sanding with fine glasspaper to provide a key for the next coat. Always read and follow the manufacturer’s recommendations for the best time to apply the second coat – some brands advise applying it within eight hours of the first.